This past July, Kaylee at 16 years old started having trouble walking. After 3 weeks and 5 trips to the hospital she was medi-vaced to BC Children’s Hospital where she was diagnosed with an Undifferentiated Metastatic Sarcoma. By this time she was completely paralyzed from the chest down. Kaylee had surgery on her spine which they took out 80% of the tumor to release her spinal cord. Since the surgery to remove the cancer from Kaylee’s spine she received intensive chemotherapy, radiation and physiotherapy. Kaylee was wheelchair bound until October. Kaylee had been relearning how to walk but still needed crutches to do so. Her scans in October showed no signs of the original tumor. We were all very happy with all the scan results. We now were able to go home for longer periods of time. Until January when Kaylee and her mom arrived at children’s hospital for her 9th round of chemo. Mom had a bad gut feeling and asked for an MRI, well the MRI showed new tumors in her spine up against the spinal cord at the base of her skull. She started to complain about headaches which made for a MRI to her head where they found a tumor on her brain. She started radiation right away to both spots and chemotherapy was administered that week. Things were going as good as expected until Kaylee had two full body seizures which she was rushed to hospital by ambulance and has been admitted for a few days to recover from the seizures. After more tests it was determined that there was a bled in her brain into the tumor that caused the seizure. She was put on anti-seizure drugs and we were monitoring her daily. We were able to go home finally to spend some well deserved time with friends and family. Which we were once again air ambulanced to Vancouver as she had extreme pain in her back and severe headaches. They did another MRI which showed many more tumors on her spine and numerous tumors in her brain. The tumors were spreading aggressively and quick. With this news we were very heart broken and decided to try some treatment in Texas were we were told there is not much they could do. We came back to Canada were Kaylee underwent another round of chemotherapy. We travelled back to Penticton were Kaylee wanted to spend time with her loved ones. She passed away on April 20th, 2015 at her home with her family by her side. She was a true inspiration to many and taught everyone around her how to live life to the fulliest and not to take things for granted. She was an amazing daughter, sister and friend to many. We will miss her always and forever in our hearts. In May 2014 just after Aeson’s first birthday, Aeson was flown to BC Children’s Hospital due to a mass that was found in a X-ray. While at BCCH Aeson endured multiple test including a MRI, bone marrow biopsy, and a biopsy of the tumour. After a week of waiting for results we found out that the tumour was malignant and he was diagnosed with Stage 3 high risk Neuroblastoma, which is a tumour that was located behind his left lung close to his spine. Over the course of 7 months Aeson received 6 rounds of aggressive chemotherapy, a stem cell transplant and three weeks of radiation. Aeson is now two and half years old and in remission, he will continue to visit BC Children’s Hospital for follow up appointments and test, every appointment there is a fear of the cancer coming back and it is a fear that will never go away. We are taking a day at a time and enjoying every minute of everyday with Aeson. This is Myla Ganzeveld, age 6 years old. On February 6, 2015 she was diagnosed with a rare form of cancer called Rhabdomyosarcoma. From December 2014 through January 2015 Myla was having severe pain in her left ear. Once she was admitted to BC Children’s hospital on January 30th, 2015 she spent a full week undergoing CT scans, MRI, Lumbar puncture, and a biopsy which they found a tumor growing in her left nasal pharynx pushing on her left ear drum and throat. 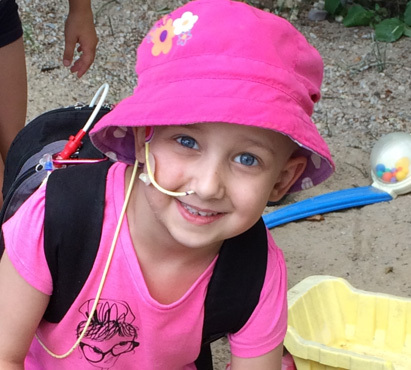 Myla has now undergone 31 weeks of chemotherapy at BCCH and Penticton. She has also completed 28 days of proton radiation therapy in Seattle from May – June 2015. She is now back home in Penticton and will undergo 7 more treatments of chemotherapy. Please support our little girl as she continues to fight her battle with cancer. She is a fun loving adventure seeking sweet heart and has gone through a lot of hospital visits and will continue to do so until January 2016. Our hopes are that she will be in full remission and her scans will come through clear once all her treatments are complete. Thank you on behalf of her parents Kyle and Jennifer, and her older sister (9 years old) Vanelle and all her family and friends. She is a fighter and we will never give up!